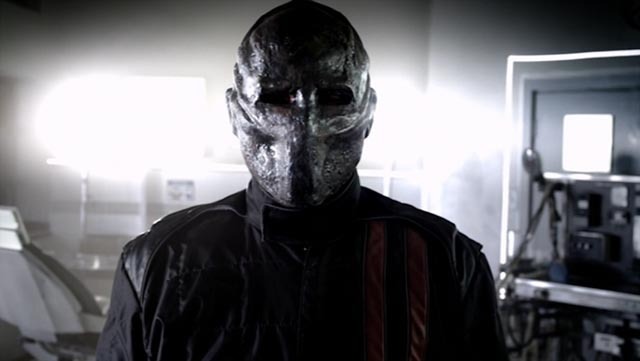 Death Race 3: Inferno, director Roel Reine’s follow-up to his Death Race 2, itself a prequel to Paul W.S. 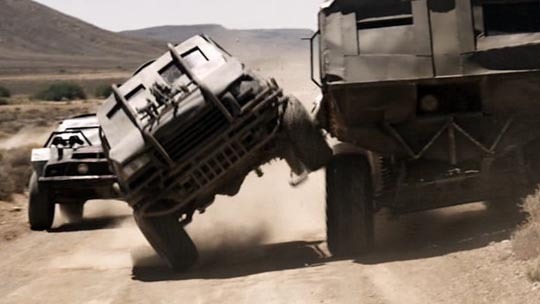 Anderson’s Death Race (2008), picks up where the previous movie ended and ends where the original begins. Carl Lucas (Luke Goss) has been “rebuilt” after his apparent death in a fiery crash, transformed into the masked driver Frankenstein, the star of a deadly sport played by condemned prisoners in the privatized prisons of businessman Weyland (Ving Rhames). As the new movie starts, Weyland’s corporation suffers a hostile take-over by Niles York (Dougray Scott), who has plans to franchise Death Race at multiple locations around the world. The first off-shoot is scheduled for South Africa and Lucas and his crew are shipped overseas for a gruelling three-day contest in the desert. Inferno gains what originality it has from the shift in location, taking advantage of the desert landscape as well as African townships which give it visual echoes of the social upheavals which accompanied the end of the apartheid regime. 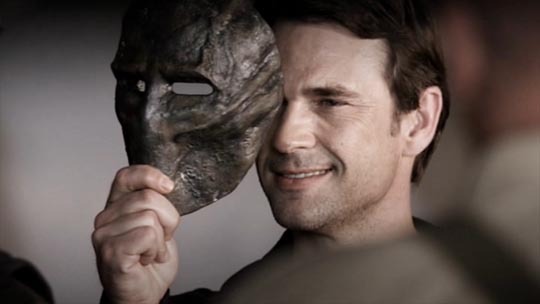 The sketched in character conflicts involve, on the one side, the crew’s resentment of Lucas’s having kept his survival a secret (something he had to do to protect them) and on the other side, York’s increasing interference in the race which threatens the success of the franchise as he becomes too personally involved. Anderson’s original film was a reworking of Paul Bartel’s satirical action-comedy Death Race 2000 (1975) as a grim dystopian commentary on current social trends (the privatization and monetizing of the U.S. penal system; the rise of increasingly violent “sports” like MMA; the Internet’s insatiable consumption of graphic content). 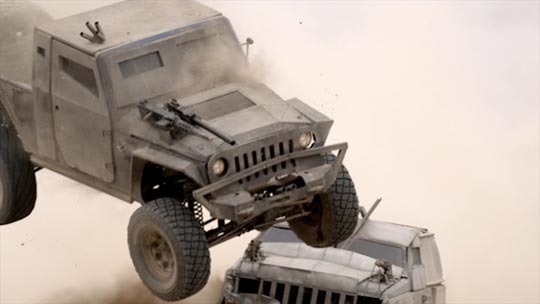 It was one of the best and most visceral action films of the decade, its impact deriving from the director’s decision to go with real vehicles and stunts rather than CG, and his ability to stage, shoot and edit the action in such a way that no matter how chaotic it got, the viewer could always tell what was happening and what the relationships were between the various drivers. While Reine continues this non-CG approach, however, his editors chop the action up into such fragments that the cutting defeats the purpose – what we get is a visual frenzy which obscures rather than reveals what’s going on. 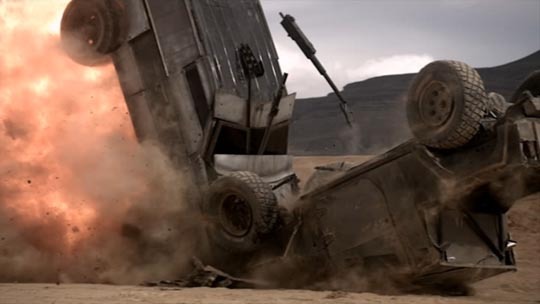 On his enthusiastic commentary track on the disk, Reine asserts that he prefers to cover action in extended shots which clearly display the stunts being performed, implying that this slice-and-dice approach represents what he and his producers believe is what audiences want. But despite this, Reine isn’t just a direct-to-video hack: he gets decent performances from his cast and, as his own cameraman, he has an excellent eye for dynamic imagery. In fact, it’s the look of the movie which is most significant as it illustrates dramatically what is now possible with the latest digital cameras. Shot primarily with new Red Epic cameras, the film has a richly cinematic look which belies its small budget (just $6.5 million). The sensitivity of the new chips allows for effective low- and natural-light shooting, with a remarkable contrast range (shooting directly into bright lights doesn’t blow out the image the way it used to on video). 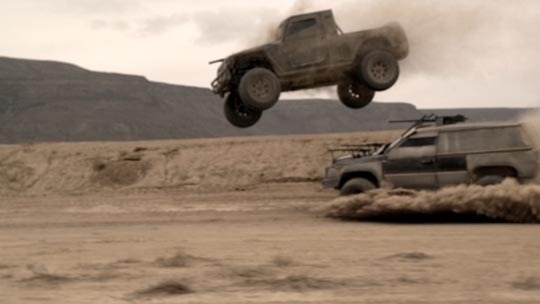 And more importantly for an action movie like this, these cameras provide the kind of fast-paced shooting which allows Reine to create large-scale action on a very tight schedule – principal photography took just four weeks, with an additional two weeks of shooting with a reduced crew for all the desert driving sequences. Reine claims he does 85-90 set-ups a day, often with multiple cameras, generating a lot of material to work with. As theatrical features are now almost exclusively shot on hi-def digital video, the use of this equipment closes the production gap between big budget movies and cheaper direct-to-disk product. 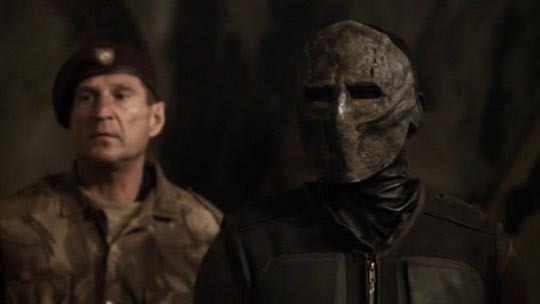 While Death Race 3: Inferno is itself basically just a slick popcorn movie, it represents interesting new possibilities for low-budget filmmaking. Reine’s movie looks as polished and visually textured as Anderson’s $45 million Death Race; the only difference exists at the creative level, with a weaker script and less coherent editing. The Universal DVD supplies an excellent picture with dynamic sound, as well as a number of extras. 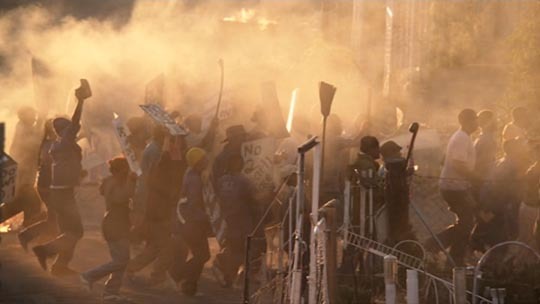 The most significant is that commentary track with director Roel Reine, a Dutch director transplanted to South Africa, who has some interesting comments about shooting in the black townships around Cape Town, with echoes of the violence of the apartheid era. The track is rich in technical details. As Reine explains, one of the advantages of digital equipment is the advent of cheap, “disposable” hi-def cameras which can be placed in dangerous positions in and around the stunt vehicles to provide what would previously have been impossible shots – he mentions at least once salvaging a memory card from a camera melted in a vehicle fire and retrieving a shot from within the explosion. This kind of thing would previously have had to be simulated by CG, resulting in a less visceral effect. In addition to the commentary, there are also a handful of deleted scenes and a brief making-of featurette. The Blu-ray has a couple of additional features, including a brief piece about co-star Danny Trejo and an alternate opening which fills in the backstory in more detail with clips from the previous movies. This entry was posted in Review and tagged Action, Digital Cinema, Science Fiction. Bookmark the permalink.